Today's episode of The Star Wars Show featured some big news, with the announcement that Star Wars Celebration 2019 will take place in Chicago. 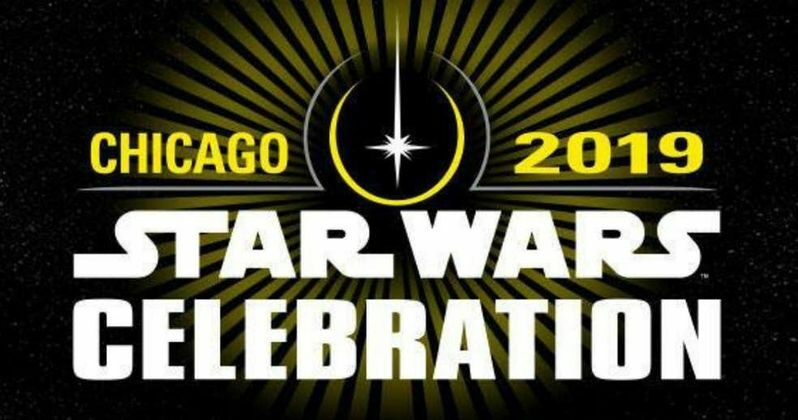 The five-day event will take place from April 11-15, 2019 at McCormick Place, which will also mark the 20th Anniversary of Star Wars Celebration, which first took place at Wings Over the Rockies Air and Space Museum in Denver, Colorado in April 1999. While no details about panels or appearances have been revealed yet, fans can start purchasing their tickets, including single-day, multi-day and VIP passes, on June 5 at 12 PM CST. There will be no Star Wars Celebration this year, and it marks the convention's first return to the Midwest since Celebration II and Celebration II, which were both held at the Indiana Convention Center in Indianapolis, Indiana in 2002, and 2005, respectively. This year marks the first since 2014 that there has been no Celebration, following a stretch of three years in a row with the 2015 Celebration taking place at the Anaheim Convention Center in Anaheim, California, the 2016 Celebration heading across the pond to ExCel London and last year's Celebration taking place at the Orange County Convention Center in Orlando, Florida. While no events or panels have been confirmed, it seems likely that Star Wars Celebration 2019 will give fans around the world the first look at Star Wars 9, which is slated to start filming this summer and has been slated for release on December 20, 2019. DIsney and LucasFilm used last year's Celebration to unveil the trailer for Star Wars: The Last Jedi, so it wouldn't be surprising if the studio followed suit with the first trailer for Star Wars 9 debuting during next year's Star Wars Celebration. It could also be where the first poster and perhaps the full title will be unveiled as well. Star Wars 9 will most likely be the centerpiece of the Star Wars Celebration, but it's also possible that Disney and LucasFilm could use the five-day event to make some big announcements regarding the future of this franchise, set in a galaxy far, far away. There have long been rumors of a third spin-off, which once had Josh Trank (Fantastic Four) set to direct before he was unceremoniously removed from the project, after rumors of his questionable behavior on the set of Fantastic Four surfaced. While it was never confirmed who the subject of this spin-off would be, there have been rumors that it could focus on Yoda, Boba Fett or Obi-Wan Kenobi, but nothing has been confirmed. It's possible that LucasFilm could also announce the first details about the new Star Wars trilogy that Star Wars: The Last Jedi director Rian Johnson is developing, but there is no word on when the studio may be ready to unveil any details about that secretive project at this time. StarWars.com broke the news on the Star Wars Celebration 2019 location earlier today, along with the new episode of The Star Wars Show. Take a look at this episode of The Star Wars Show, which includes behind-the-scenes footage from their red carpet coverage of the Solo: A Star Wars Story premiere, while taking a tour of the Millennium Falcon with Pablo Hidalgo.